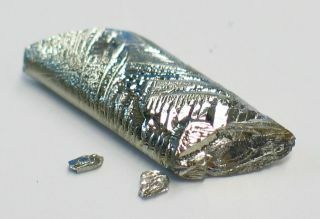 A photo of an ultra pure tellurium crystal. Astronomers have discovered the material in deep space by analyzing light from three ancient stars. Light from three ancient stars at the edge of the Milky Way indicates that the stars contain tellurium, a brittle, superconducting element that is rare on Earth. The cosmic discovery, which also spotted traces of other heavy elements, supports the theory that these elements were synthesized in the rapidly collapsing cores of rare supernovas (stellar explosions). According to the theory, heavy atoms form during rapid nuclear fusion at the heart of some supernovas. Called r-process, it sets in when a supernova core collapses, bombarding atomic nuclei with a fierce onslaught of neutrons. The result is the production of atoms heavier than iron, which then get hurled into space, enriching the cloud of gas and dust that eventually collapses to form another star. To analyze the chemical composition of the three stars at the Milky Way's edge, the researchers studied data gathered by the Hubble Space Telescope's spectrograph, an instrument that splits incoming starlight into a spectrum of wavelengths. If an element is present in a star, the atoms of that element absorb starlight at specific wavelengths, leaving telltale dips in signal in the spectrograph's data. The scientists detected dips in the ultraviolet region of the spectrum at a wavelength that matched tellurium's light absorption, signifying the presence of the rare element in the 12-billion-year-old stars. Furthermore, the abundance of tellurium relative to that of other heavy elements, such as barium and strontium, was the same in all three stars. According to Frebel, the matching ratios support the theory that a rare type of supernova may have created the elements in the bottom half of the periodic table, including tellurium. The finding helps flesh out one chapter in the cosmic history of the elements, an ongoing effort of astronomers and nuclear physicists to understand the formation of the 94 naturally occurring types of matter. According to Jennifer Johnson, an associate professor of astronomy at Ohio State University who was not involved in the new research, tellurium has been a "tough" element to detect because it absorbs light in the ultraviolet spectrum. UV signals tend to be flooded by sunlight and are impossible for ground-based telescopes to spot. "If you look at the periodic table, tellurium is right in the middle of these elements that are hard for us to measure," Johnson said in a statement. "If we need to understand how [the r-process] works in the universe, we really have to measure this part of the periodic table. It's really cool that they got this element in this sea of unknown-ness." Frebel and her colleagues are attempting to fill in other spots in the periodic table, too, by looking for signs of other heavy elements in starlight. "There are still quite a few holes," she said. "Every now and then, we can add an element, and it adds another data point that makes our work easier." The researchers have published their findings online in Astrophysical Journal Letters.